"There are no excuses. You can always make time for adventure." Kyle Frost was an Adventure Contest Finalist. Shortly after we announced the winner and finalists, he headed out to New Zealand, doing what we'd expect—leaving the digital world far behind. Just hours after that initial message, I threw my gear in the car and we were on the road by 8:00PM Friday evening. We hardly ever leave with more than a vague idea of how our weekend will pan out, and this was no exception. 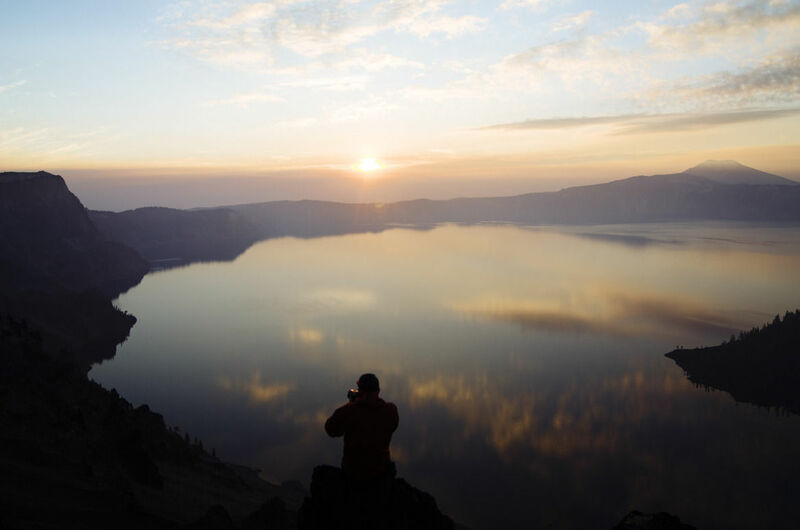 7 hours and several cups of coffee later, we rolled into a pitch dark overlook at Crater Lake National Park and closed our eyes for a few precious hours of sleep. Less than 12 hours after leaving San Francisco—now Saturday morning—the sun crested the rim of the mountains. The lake erupted in shades of pink and gold and the water offered a mirror to reflect the colors and clouds. There are few things that match a good sunrise. As beautiful as sunsets can be, they are endings, harbingers of the coming night. A sunrise brings with it the same incredible golden hour but with warmth, the promise of a new day, and new adventures. A morning drive through central Oregon took us past a cloud-shrouded Mt. Hood to the Columbia River Gorge. Lunch was a well deserved beer and burger in Hood River. The afternoon was spent exploring waterfalls along the gorge and wandering around Portland. I turned the wheel over to Julian, who booked it to the coast at questionable speeds. Luckily, we arrived in Cannon Beach and hit the ground at a full sprint to catch the clouds lighting up with hues of purple and gold; the evening mist added an otherworldly backdrop to an already fantastic sunset. Following some night driving and a short and fitful night of sleep in a small state park on the Oregon coast, Sunday brought a leisurely drive down Highway 101, with stops to take in the picturesque shoreline and some wandering among the giants at Humboldt Redwoods State Park. We caught the sunset and a view of the Golden Gate from Hawk Hill at 8:00PM on Sunday. In 48 hours we’d driven 1500 miles, woken up to a spectacular sunrise at Crater Lake, enjoyed burgers and beers in Hood River, explored waterfalls, waded through streams, explored Portland, watched an incredible sunset at Cannon Beach, marveled at the scenery along the Oregon Coast, and felt tiny amongst groves of California redwoods. We both made it to work Monday morning. There are no excuses. You can always make time for adventure. Follow Kyle on Instagram and Twitter.